Learning tags are like labels or keywords that can be attached to stories. Learning sets are simply folders of these tags. By attaching tags to stories, they allow teachers to link to elements of their curriculum or standards (but could also relate to outcomes, goals, dispositions, schemas, values, culture, interests or subjects). Learn more about learning sets. The learning sets you select on your Network setup Learning sets page will be available for teachers across all your services to use as soon as they sign up. Admins of these services are free to customise and add to these sets if they wish. To access this area go to your 'Network setup' and select 'Learning sets'. 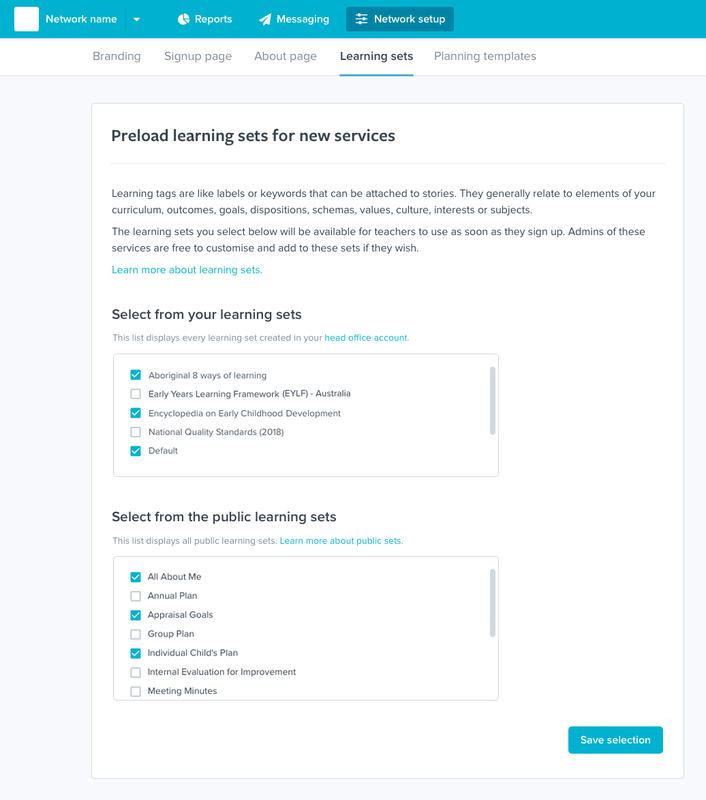 The first list, 'Select from your learning sets', displays all sets that you've created, in or copied to, your head office service's learning sets page. Learn how to create and manage your learning sets. The second list, 'Select from the public learning sets' displays all sets that are publicly available within Storypark. These are sets that have been created by the Storypark professional practice team, or by other services and shared publicly. Learn more about public learning sets. You can select any number of either of these lists but we suggest working with no more than 6-8 relevant learning sets (can be a mix of ones that you’ve created yourself and ones you've selected from the public sets). Your selection will then pre-populate your service's learning sets pages, and be available to use when they create a story and go to add learning tags. It can be helpful to have one person responsible for creating your sets and tags to prevent multiple sets of the same tags being created, and to keep the learning sets in order. Here are our tips on how to choose your learning sets. What are learning tags and sets? What are public learning sets?